Prototypes of the company's hydrogen fuel cell technology are on show this week at the Ceatec exhibition in Japan where the company's president, Mike Aizawa, said he hopes the first products will be on sale next year. The promise of fuel cells is attractive: instantly available electricity from a safe, disposable fuel cartridge. They are typically seen as a way to provide electricity where there is no power grid, when electricity supply has failed or, in a portable package, for on-the-go charging of gadgets such as smartphones or tablets. Japan's major electronics companies went through a period of several years beginning around 2005 when they showed prototype fuel cells, but none of them ever managed to reach the market and much of that research appears to have ended. "They all failed because they used Methanol," said Aizawa in an interview with the IDG News Service. "They couldn't figure out a way to do it efficiently. If I had thought they would have succeeded, I never would have started my company." Aquafairy was established in mid-2006 and has been developing a fuel cell based on hydrogen. Typically an extremely reactive fuel, the company has developed a treatment that turns it into a sold form that's safe to handle but is still useful as a fuel, said Aizawa. At Ceatec, the company has three working prototype fuel cells on show. A pocket-size portable model, designed to fully charge a smartphone, appeared to be attracting the most interest. Producing 2.5 watts of power, it's a little lighter than a smartphone at 89 grams and measures about the same size. Through USB, it can charge most portable electronics gadgets. A second charger is already in field trials in Japan and can deliver 200 watts of power. Weighing 7 kilograms and a little smaller than a conventional car battery, it's powered by a canister containing solid hydrogen that looks similar to the small butane canisters used in camping stoves. Developed with Japan's New Energy and Industrial Technology Development Organization (NEDO), it has a couple of USB outputs and two conventional AC outputs. This charger is being eyed for use after disasters, like 2011's earthquake and tsunami that hit Japan. The final charger is a long-life type designed for use in remote areas, such as mountains and forests. It provides just half a watt, but can do so for half a year meaning trips to replace batteries on things like scientific measuring equipment don't need to be made frequently. 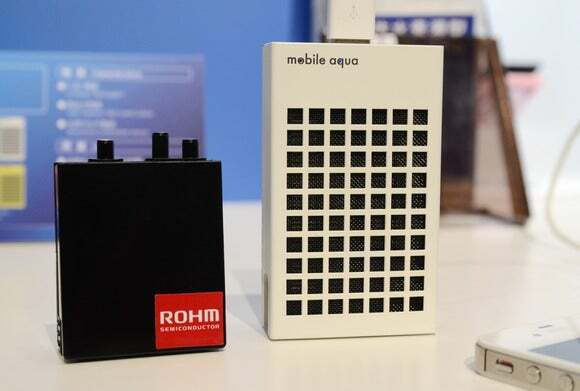 Aquafairy is working with Japan's Rohm on the control circuitry for the chargers and to bring the products to market, but says it is also looking for partnerships with other companies and organizations. Aizawa didn't provide a cost for the technology, but said he knows he has to deliver it at a consumer-friendly price. "That's my job for the next year," he said.